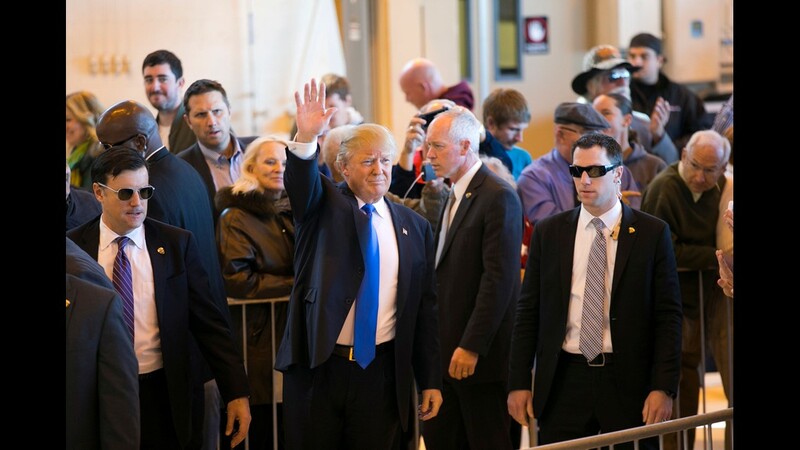 Republican Presidential candidate Donald Trump waves to the crowd before his speech at Phoenix-Mesa Gateway Airport in Mea on December 16, 2015. 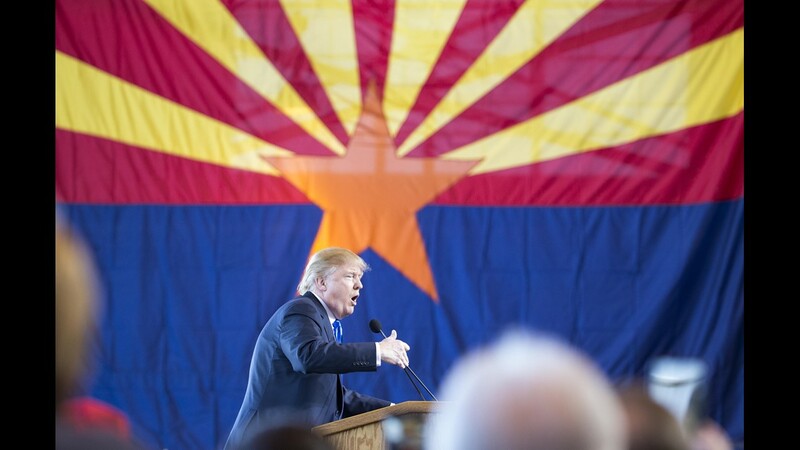 Republican Presidential candidate Donald Trump speaks during a campaign stop at Phoenix-Mesa Gateway Airport in Mea on December 16, 2015. 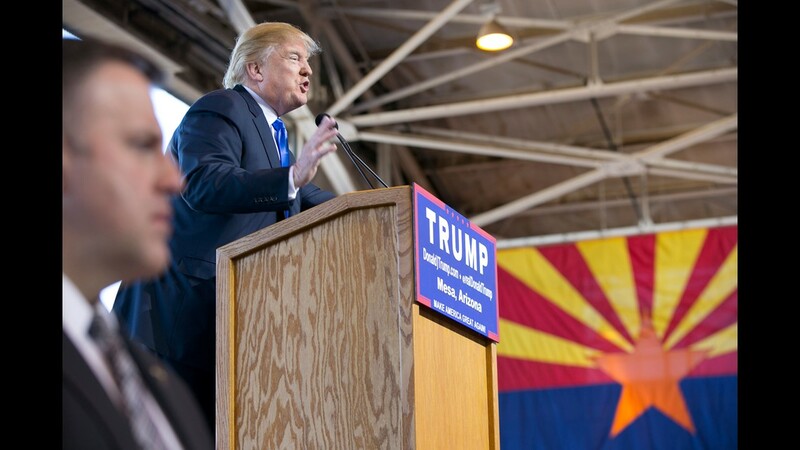 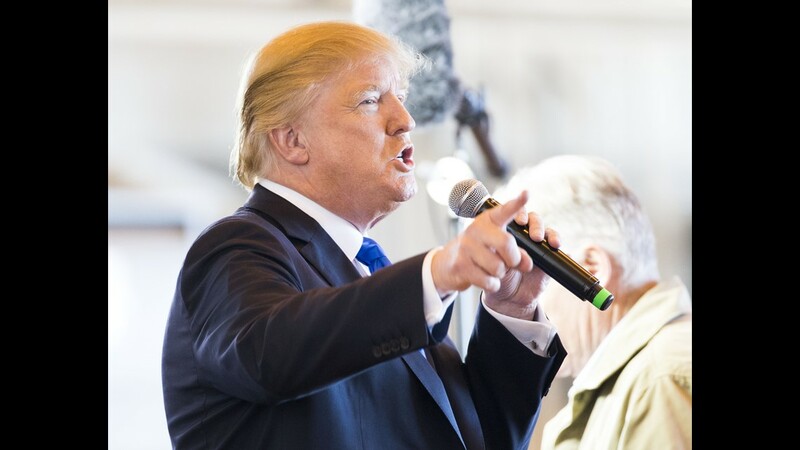 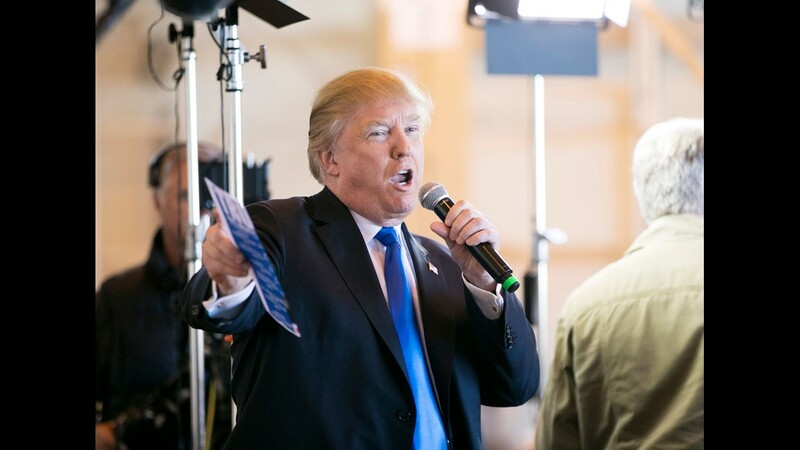 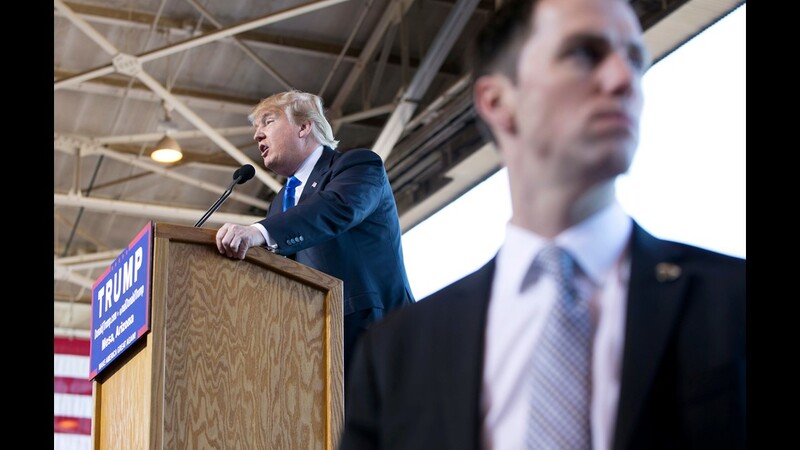 Republican Presidential candidate Donald Trump speaks to the crowd during a campaign stop at Phoenix-Mesa Gateway Airport in Mea on December 16, 2015. 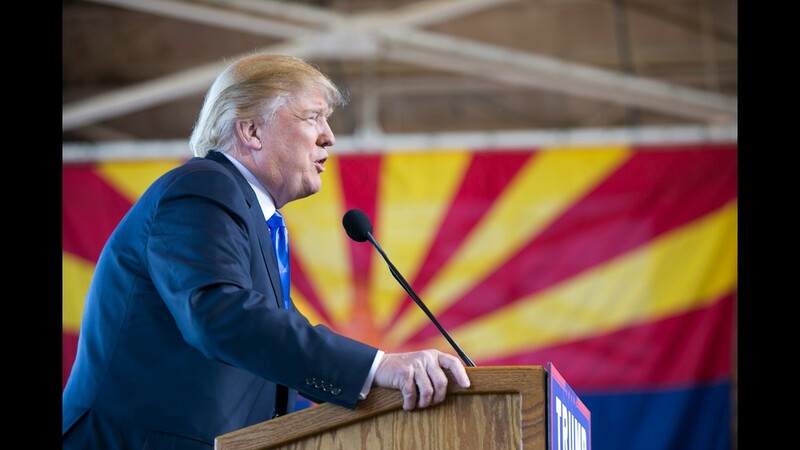 Republican presidential candidate Donald Trump speaks during a campaign rally at Phoenix-Mesa Gateway Airport Dec. 16, 2015. 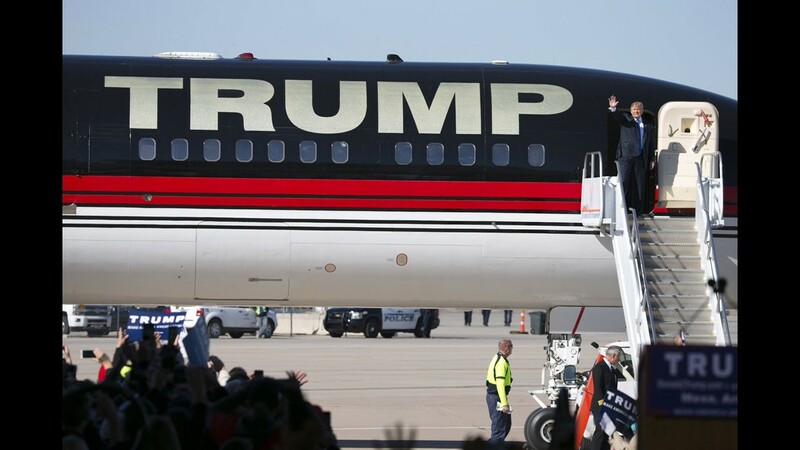 Republican presidential candidate Donald Trump boards his plane after a campaign rally at Phoenix-Mesa Gateway Airport Dec. 16, 2015. 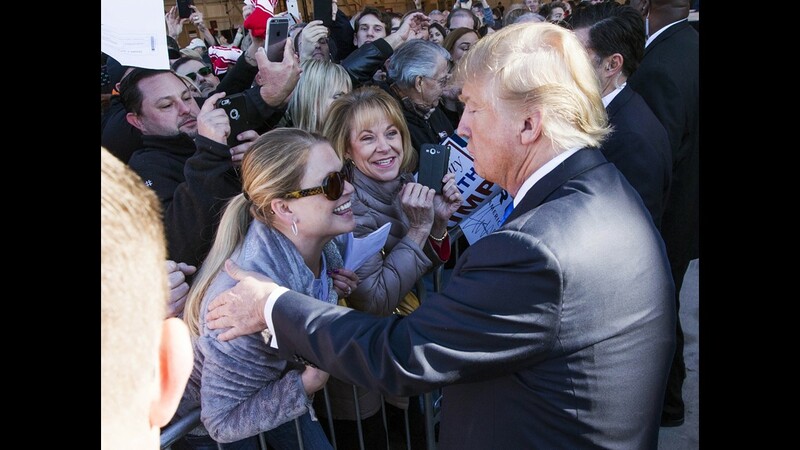 Republican presidential candidate Donald Trump shakes hands with admirers after a campaign rally at Phoenix-Mesa Gateway Airport Dec. 16, 2015. 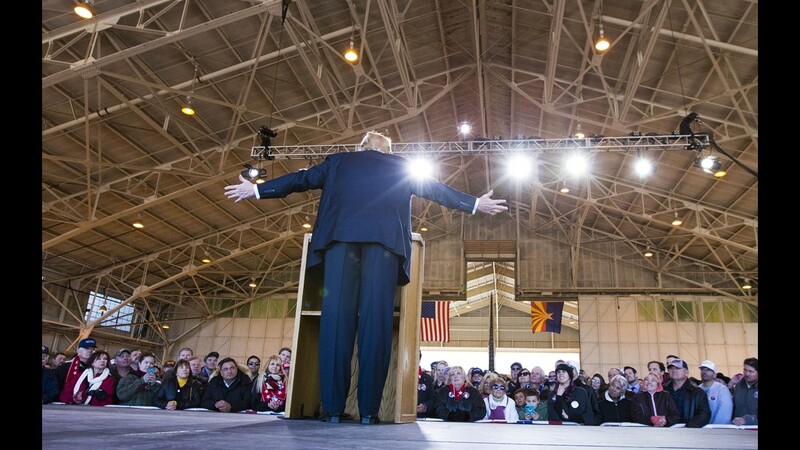 Republican presidential candidate Donald Trump acknowledges the crowd after his remarks at Phoenix-Mesa Gateway Airport Dec.16, 2015. 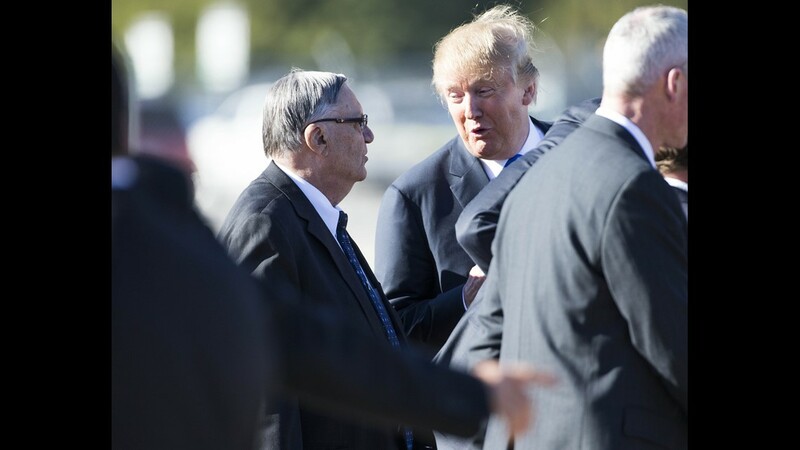 Maricopa County Sheriff Joe Arpaio (left) talks with Republican presidential candidate Donald Trump after a campaign rally at Phoenix-Mesa Gateway Airport Dec. 16, 2015. 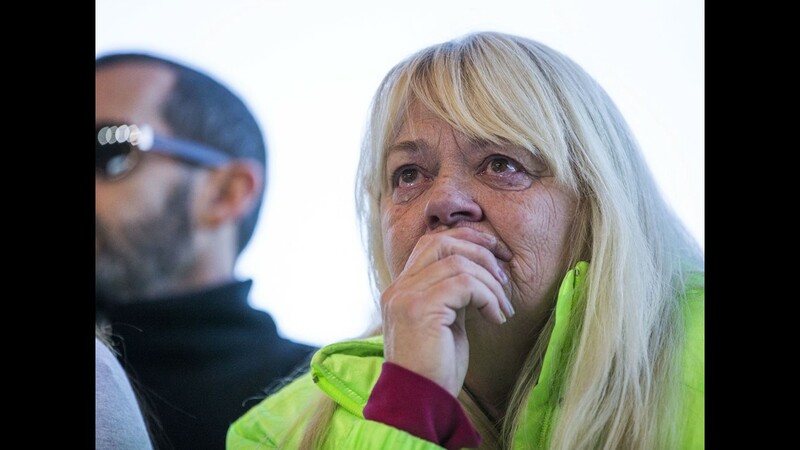 A supporter cries during a rally for Republican presidential candidate Donald Trump at Phoenix-Mesa Gateway Airport Dec. 16, 2015. 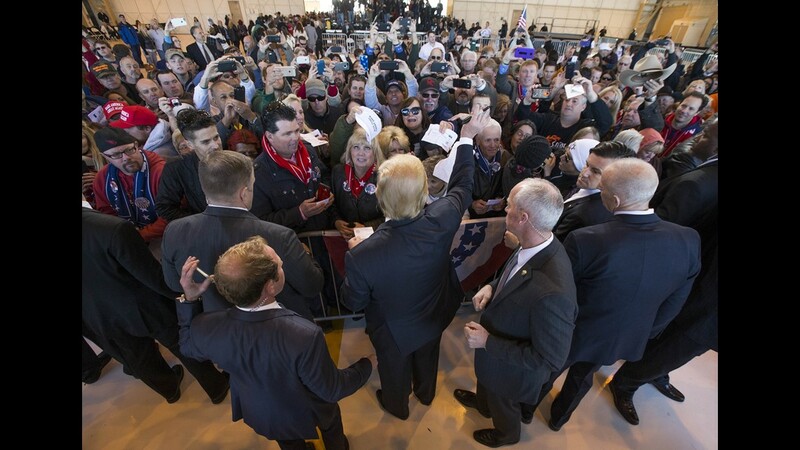 Republican presidential candidate Donald Trump points to audience members following his stump speech at Phoenix-Mesa Gateway Airport Dec. 16, 2015. 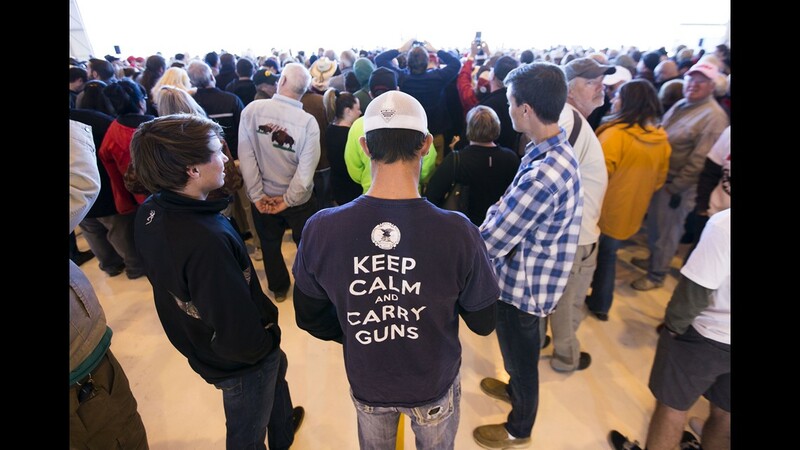 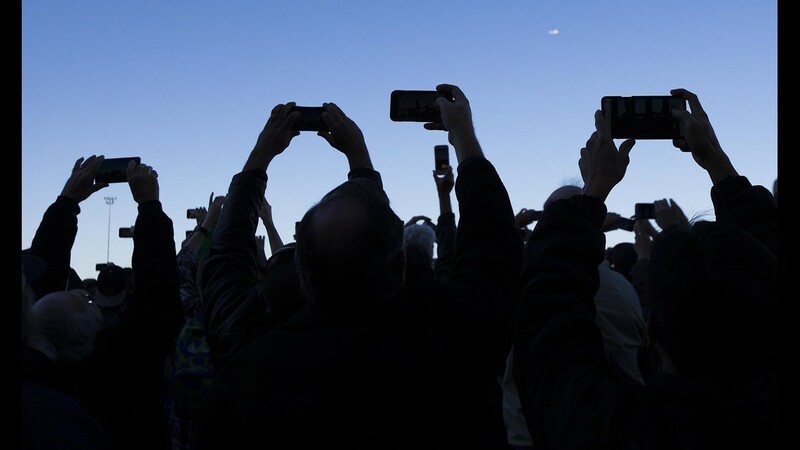 Supporters use their phones to capture Republican presidential candidate Donald Trump during a rally at Phoenix-Mesa Gateway Airport Dec. 16, 2015. 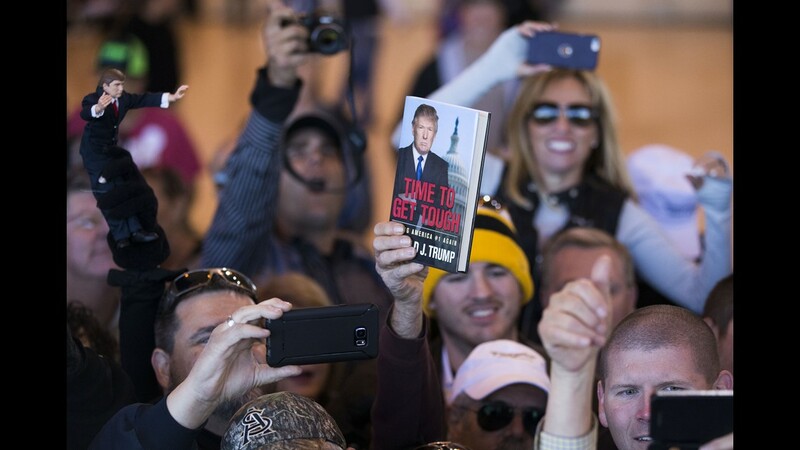 Supporters try to get a glmpse of Republican presidential candidate Donald Trump during a rally at Phoenix-Mesa Gateway Airport Dec. 16, 2015. 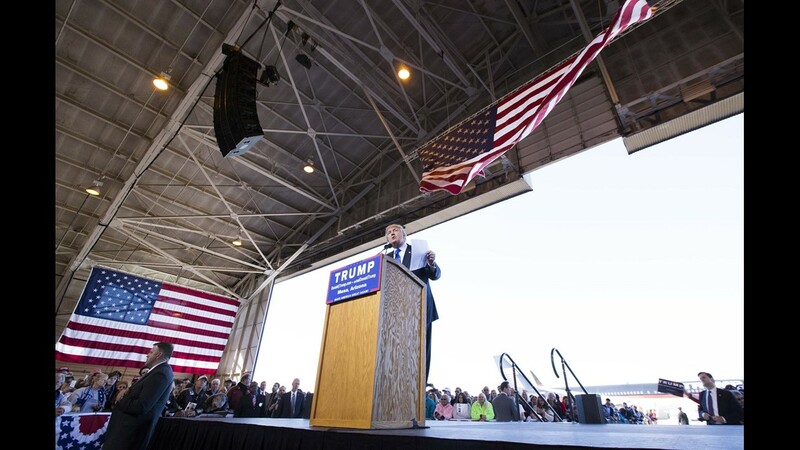 Republican presidential candidate Donald Trump speaks during a campaign rally at Phoenix-Mesa Gateway Airport on Wednesday, with his jet behind him. 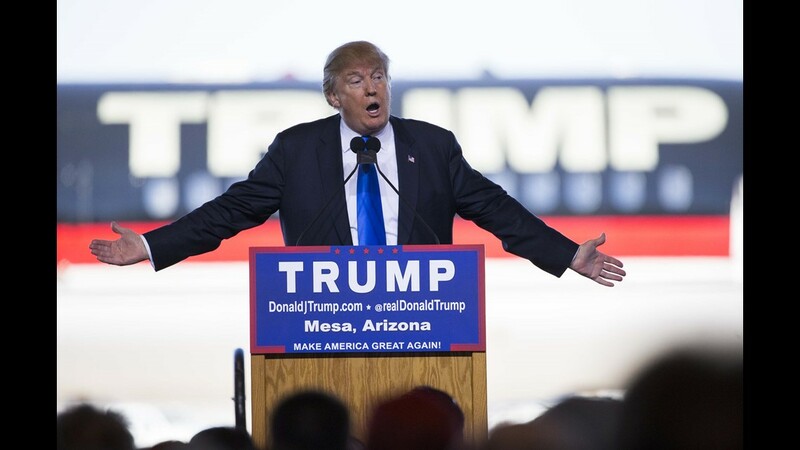 Republican presidential candidate Donald Trump speaks during a campaign rally at Phoenix-Mesa Gateway Airport on Wednesday. 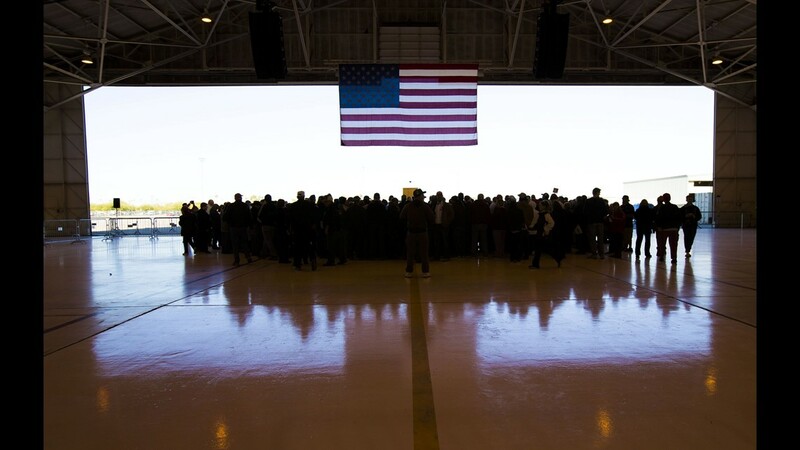 Republican presidential candidate Donald Trump addresses supporters inside a hangar at Phoenix-Mesa Gateway Airport on Wednesday. 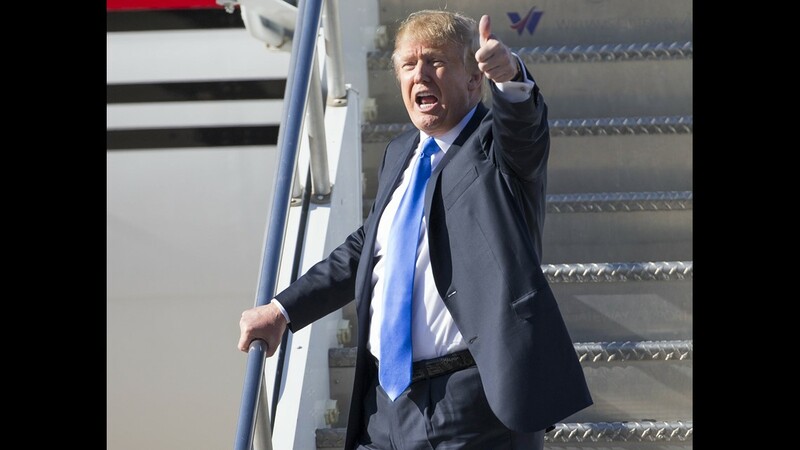 Republican Presidential candidate Donald Trump waves to the road after getting off his jet for a campaign stop at a hangar at Phoenix-Mesa Gateway Airport in Mesa on Wednesday. 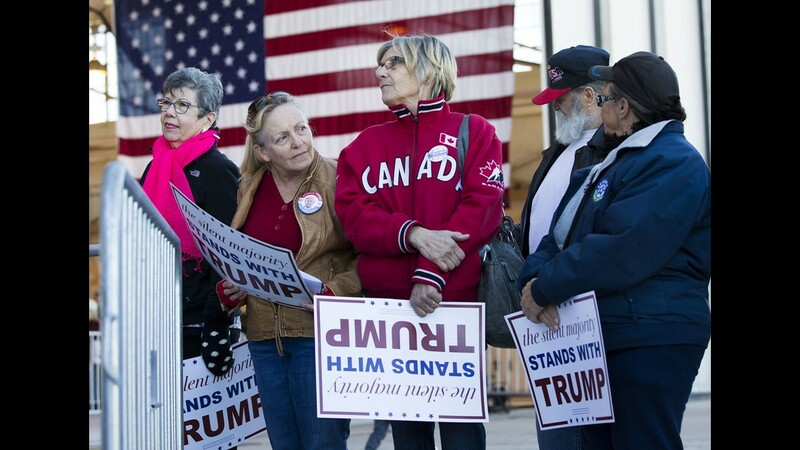 Supporters gather during a campaign rally for Republican presidential candidate Donald Trump at Phoenix-Mesa Gateway Airport on Wednesday. 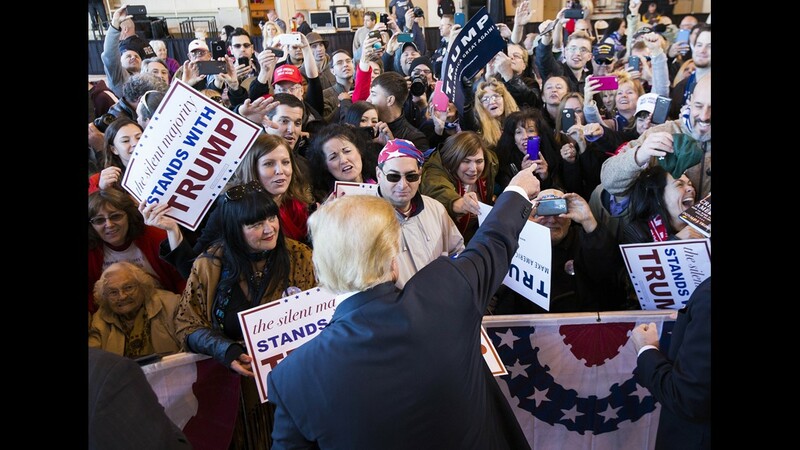 Supporters gather for a campaign rally for Republican presidential candidate Donald Trump at Phoenix-Mesa Gateway Airport on Wednesday. 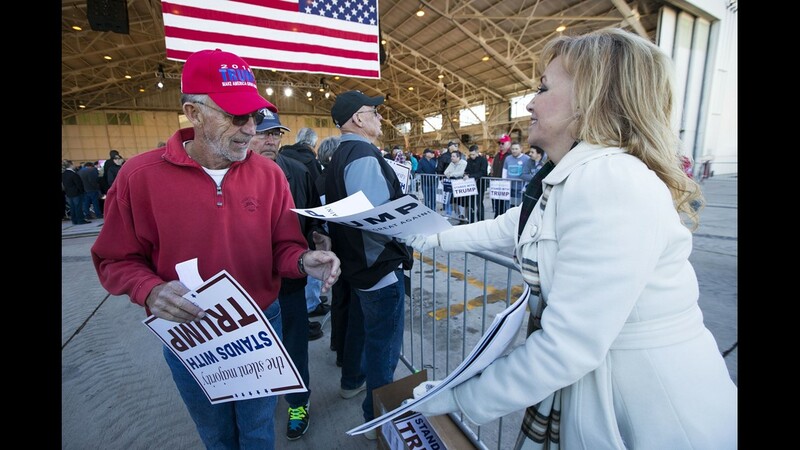 Volunteer Julie Fisher hands out signs to supporters during a campaign rally for Republican presidential candidate Donald Trump at Phoenix-Mesa Gateway Airport on Wednesday. 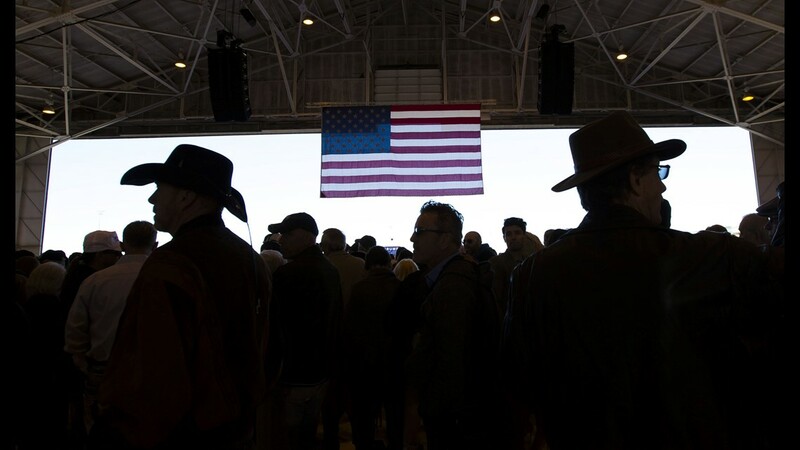 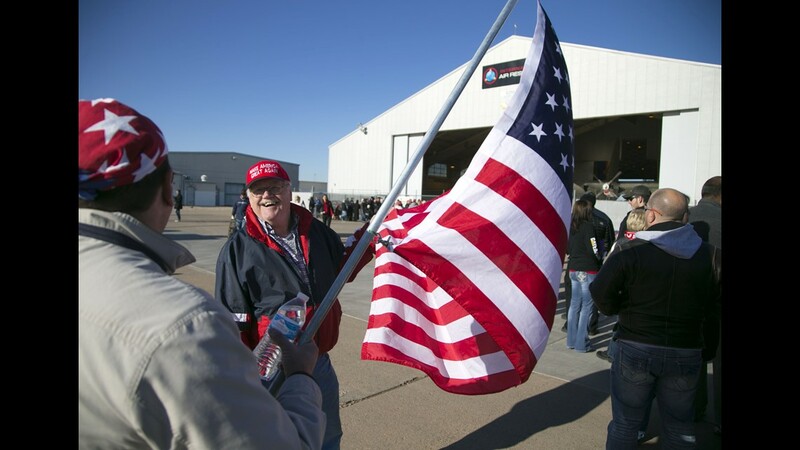 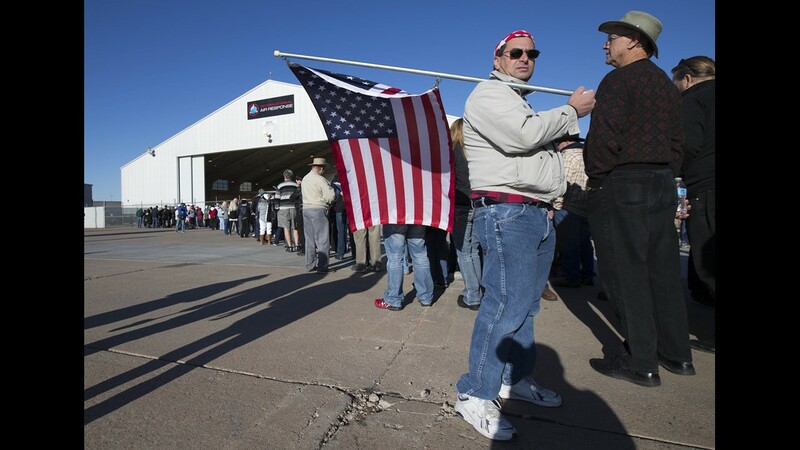 Trump supporters Nohl Rosen (left) of Phoenix and Bill Theel of Rochester, Minn., hoist the American flag while waiting in line to get into an airplane hangar for a campaign stop at Phoenix-Mesa Gateway Airport in Mesa on Wednesday. 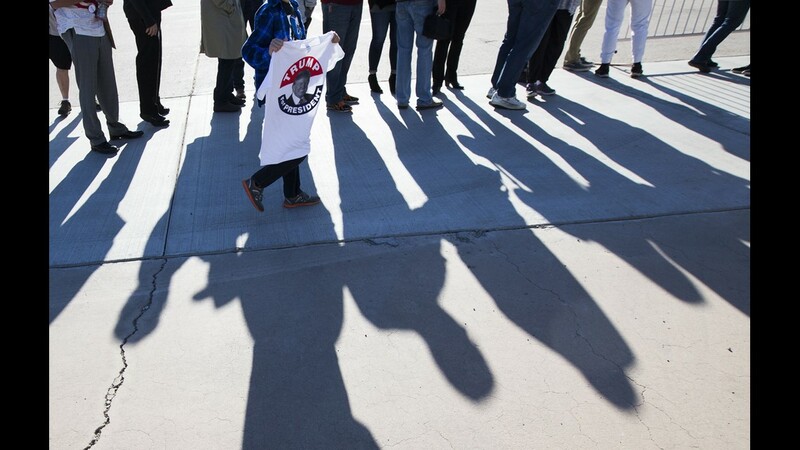 Tayton Boltz, 10. of Mesa pitches T-shirts for $20 prior to a campaign rally for Republican presidential candidate Donald Trump at Phoenix-Mesa Gateway Airport on Wednesday. 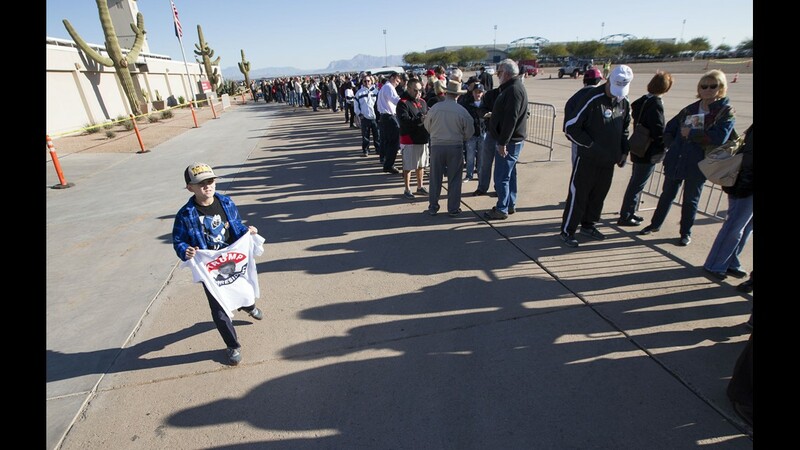 Tayton Boltz, 10, of Mesa, hawks T-shirts for $20 before the campaign rally for Republican presidential candidate Donald Trump at Phoenix-Mesa Gateway Airport on Wednesday. 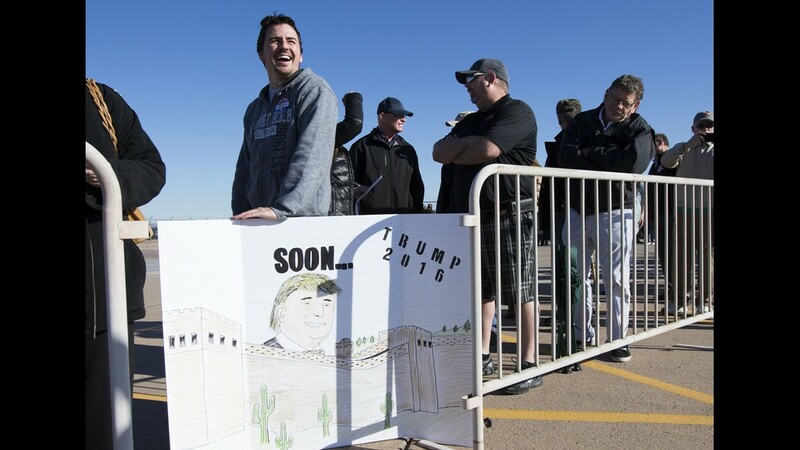 Eric Smaltz of Surprise waits in line to enter a campaign rally for Republican presidential candidate Donald Trump at Phoenix-Mesa Gateway Airport on Wednesday. 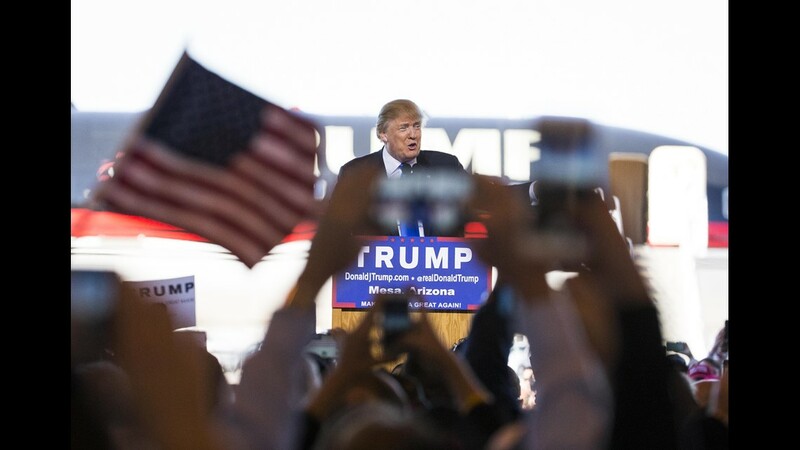 Ryan Kunz holds a sign at a campaign rally for Republican presidential candidate Donald Trump at Phoenix-Mesa Gateway Airport on Wednesday. 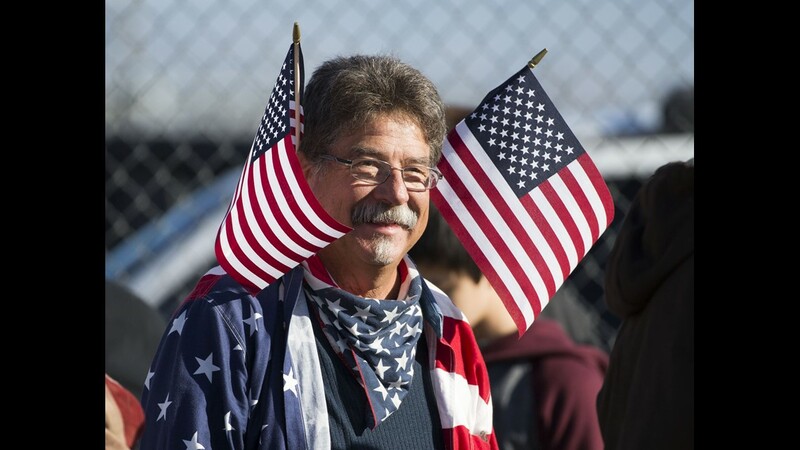 Nohl Rosen of Phoenix holds a flag while waiting in line for a campaign rally for Republican presidential candidate Donald Trump at Phoenix-Mesa Gateway Airport on Wednesday. 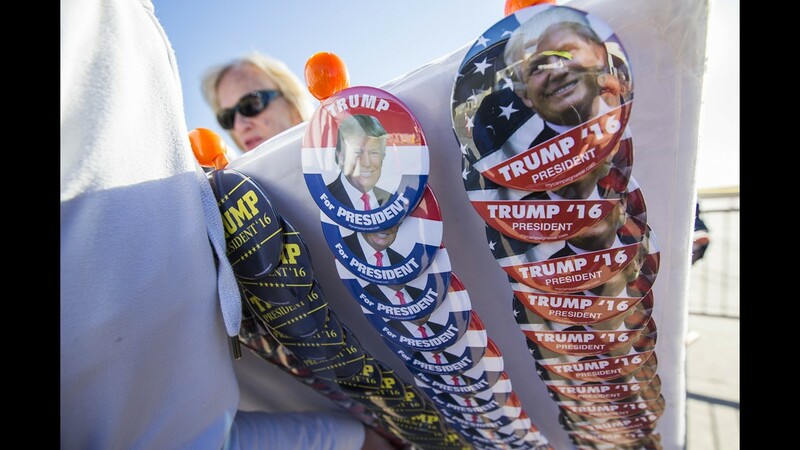 Ann Gemoll of Mesa shops for buttons during a campaign rally for Republican presidential candidate Donald Trump at Phoenix-Mesa Gateway Airport on Wednesday.